The difficulty is met, however, by taking advantage of the excessive minuteness of light waves themselves. This double length of the water column is something like forty feet. In this forty feet there are, in round numbers, 14,000,000 waves. Hence the difference due to a velocity of twenty feet per second, which is the velocity of the water current, would produce a displacement of the interference fringes (produced by two beams, one of which passes down the column and the other up the column of the moving liquid) of about one-half a fringe, which corresponds to a difference of one-half a light wave in the paths. Reversing the water current should produce a shifting of one-half a fringe in the opposite direction, so that the total shifting would actually be of the order of one interference fringe. But we can easily observe one-tenth of a fringe, or in some cases even less than that. Now, one fringe would be the displacement if water is the medium which transmits the light waves. 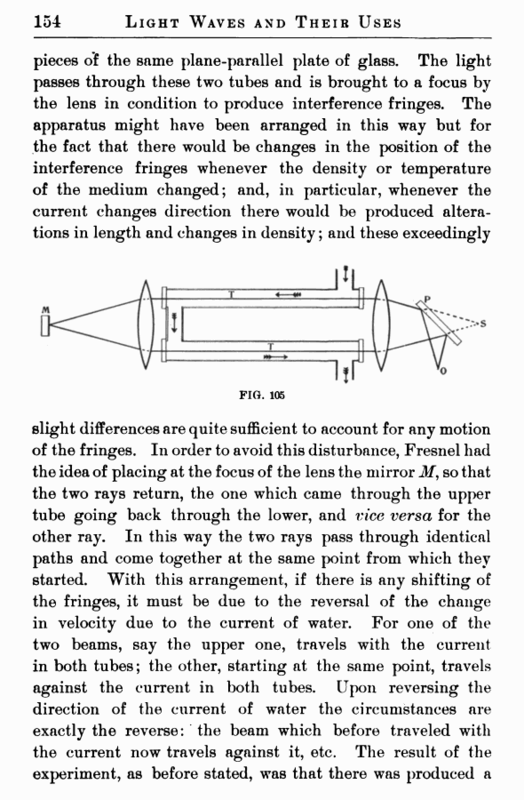 But this other medium we have been talking about moves, according to Fresnel, with a smaller velocity than the water, and the ratio of the velocity of the medium to the velocity of the water should be a particular fraction,^ namely, seven-sixteenths. In other words, then, instead of the whole fringe we ought to get a displacement of seven-sixteenths of a fringe by the reversal of the water current. 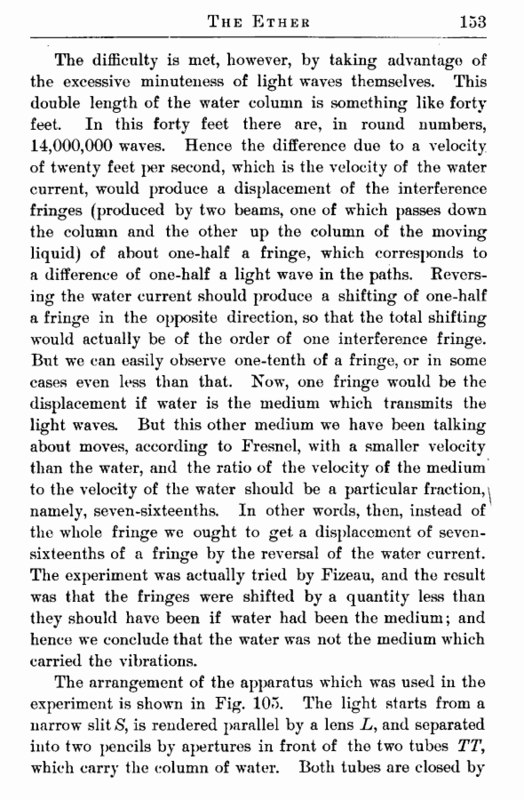 The experiment was actually tried by Fizeau, and the result was that the fringes were shifted by a quantity less than they should have been if water had been the medium; and hence we conclude that the water was not the medium which carried the vibrations.